Adjustable length plastic seals are tamper evident pull-tight seals used for a wide range of applications and small apertures, including tote boxes, valves, ATM cassettes, cash boxes, airline trolleys and fire extinguishers. The adjustable plastic pull tight seal is designed thin for admission to places with limited access. It is self-locking, and can be adjusted in various places on the seal. The plastic adjustable security seal features beaded strap suitable for application confined to small sealing space. Usually, It has an acetol locking mechanism which enhances security against tampering by heat and have many locking points on the stap. 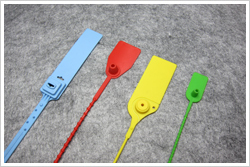 The plastic strap seal is designed with a wide strap and provide high pull strength.